The Weekend Manager at the John Wornall House is primarily responsible for giving public tours, opening and closing the Museum, providing support to volunteer docents and administrative support to staff. This is a part-time (11-hours/week) hourly, non-exempt position that reports to the Director of Public Programming and Events. Core hours are Saturdays-Sundays, flexible hours depending on the event schedule. Museum background preferred. • Perform the regular procedures to open and close the House, preparing it for public tours. • Give public tours as needed and provide support to volunteer docents. • Participate in group visits such as school and scouting field trips by giving tours and implementing program activities. • Access the database to look up and enter data for members and donors. • Answer the phones and take messages. • Process admissions, gift shop sales, and other payments such as program and event tickets and memberships. • Prepare and reconcile the cash box. • Complete administrative projects as assigned by the Executive Director, and the Director of Public Programming and Events. • Assist the Volunteer Manager in recruiting, training, scheduling, supervising, and recognizing volunteer docents for public tours. • Assist the Volunteer Manager in the development an annual appreciation program for volunteers. • Assist the Volunteer Manager in scheduling group tours and field trips and securing the volunteers and staff as needed. • Assist the Director of Public Programming and Events with curriculum development for camps (i.e. summer, winter, spring break). • Maintain an inviting and presentable environment of the facilities and grounds. • Be available to work with staff on educational and fundraising events for the Wornall/Majors House Museums (WMHM). • Commitment to the mission, vision, and strategic direction of the WMHM. • Strong attention to detail and ability to work both independently and as a team player. • Strong organizational and time management skills with the ability to multitask effectively and work flexibly and productively. • Excellent verbal and written communication skills including outstanding aptitude in customer service. • Experience in museums and/or nonprofits. • Willingness to foster the mission and values of WMHM by being an active, passionate member of our staff. This entry was posted in Employment Opportunity, HistoryMaking, Paid Opportunties on August 31, 2018 by Sandra Enriquez. Note: This is the second in a series of posts about the 1968 Oral History Project, a collaboration between UMKC’s History Department, UMKC’s Miller Nichols Library, and KCUR. For an overview of the project, see the first post here. All of this, as you might expect, makes for slow going. It seems to take about an hour to transcribe every 15 minutes of recorded interview, although a speaker who talks quickly and runs words together can take even longer. Thankfully, technology provides a bit of help. We are testing out a software called InqScribe, which allows you to use keystrokes as shortcuts to add timestamps and names, and to start, stop, and rewind the interview. For me, though, there’s also a certain benefit to this slow process. It forces me to listen in a way that we rarely do in life; I pick up on subtleties that I didn’t even understand or appreciate while I was listening closely during the interview itself. The most powerful thing about transcribing these interviews, however, has been its influence on me as a researcher. Though most of my research has not involved oral histories (I tend to research the late 19th and early 20th century, when there weren’t many recorded interviews), I have occasionally skimmed transcripts in archives to determine whether they are useful for my research. There’s nothing wrong with this–in fact, the ability to text-search a transcript has made it much easier to access useful oral histories that might not have appeared relevant at first glance–but it’s not enough. 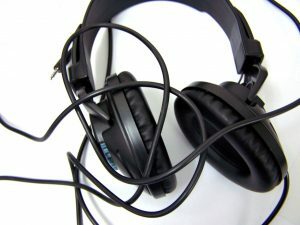 Listening for hours, making judgments about translating the spoken word into the written word, and noting the way that emotional, fascinating stories fall flat on the page has convinced me that using oral histories as sources without listening to the audio is, at best, inadequate, and, at worst, irresponsible. Much of the power and meaning of an oral history is conveyed through the voice of the speaker. It would be a shame to treat it like just another written document. This entry was posted in HistoryMaking and tagged 1968, inqscribe, kcur, miller nichols, Oral History, Transcription on July 17, 2018 by Kathryn Carpenter. During my summer Internship at the National WWI Museum and Memorial, our primary focus as Interns has been to rework lesson plans about World War I so they are ready to be used as teacher resources. I have learned that this is an in-depth process. While working on lesson plans, I found myself googling and regoogling things such as copyright laws and how they apply to everything from old newspapers to images. I became familiar with the Museum and Memorials collection of propaganda posters like they were my old friends. Some lesson plans needed only a couple citations fixed, others needed complete reformatting and writing. It was the subject matter in these lesson plans that not only kept me searching for the missing information, but would captivate me with what I would find. The lesson plan that I enjoyed working on the most was about war hero Henry Johnson and the battles he faced coming home from the service. 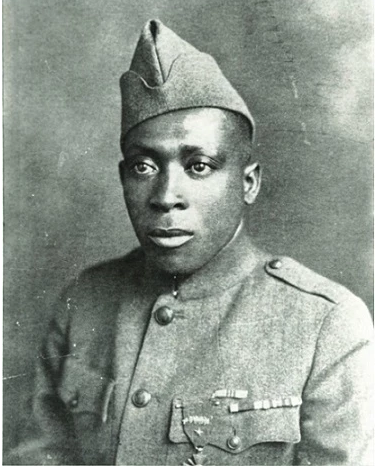 Henry Johnson was a soldier from the African American division called the “Harlem Hellrattlers” in World War 1. One day him and his buddy Needham Roberts were on watch duty when a surprise attack of twelve German soldiers appeared. Henry and Needham’s guns jammed and so they had to fight off the twelve soldiers using only knives. In the lesson plan, students are told to examine newspaper articles from the time and look at how the media presented Henry Johnson when he arrived home in 1919. They are told to compare accounts from before and after Henry Johnson gave his controversial lectures to the public. Looking at how these lectures affected the public’s opinion of him. While researching it, I found Military Intelligence reports on Johnson detailing how he was dangerous because he was said things that were not “patriotic” the government; a government that had segregated him even in the military. This is example of one perspective of him that students would look be told to analyze. Lesson plans like this work to help students understand how and why we are where we are today. Because of this I felt excited to play my part in helping this story come alive to students through the primary source documents I carefully collected. This entry was posted in HistoryMaking on July 14, 2018 by Carolyn Kovar. My name is Michael Spachek and I have been working with the Jackson County Historical Society this summer as they process the Wilborn Negative Collection and with the Alexander Majors as a Collections and Research Intern. The collection contains an estimated 500,000 historic images of Kansas City from the early 1900s to 2006. My main responsibility is to organize the collection into a system that meets archival standards and will be more user friendly in the future. Eventfully, the Wilborn Collection will be digitized and made available to the public online by Missouri’s bicentennial in 2021. I have been involved with similar photographic collections in the past, but nothing this large. So far, the most challenging part of the internship has been the size of the collection. Before I began, I thought I had a good understanding of how to process photo negative collections. Unsurprisingly, I was wrong. That hubris formed the bases for the most important lesson of the summer. In my previous experience, I did not feel like I had to be as rigorous in my processing and I made plenty of mistakes because of it. Part of that was, as an undergraduate, not knowing any better but it was also working with small collections where mistakes were easy to fix. The second I saw the boxes where the collection is held, I knew I had to become much more detailed in my approach to processing. Thanks to the help of the Jackson County staff, I have done just that. They taught me the proper way to put a collection into an organized system of box and file numbers and how to describe each file. I have learned to double check each box as I complete it to make sure the files are in order. Needless to say, I am much better prepared for a career in public history now then I was a few short weeks ago. In addition to the Jackson County Historical Society, I am also interning for the Alexander Majors House Museum this summer. For this internship, I am processing their collection of blacksmithing tools and creating an exhibit that is focused on blacksmithing in the 19th century and the role of skilled slave labor on the Majors property in the 1850s. The first step was separating the blacksmithing tools from the random assortment of other objects. Right now, I am beginning to research the individual tools to determine if they fall into the Museums timeframe of the 1850s to the 1880s. The final product will be an interpretive space that educates the public on this topic. The Museum has a wide variety of visitors and the exhibit will need to be appropriate for all ages. That has challenged me to really think about how to interpret very serious topics like slavery for children and adults. I am not quite sure how I will do that yet but the process has been enlightening. However, that is not the only the challenge of this internship. I have very little blacksmithing knowledge so it has been a test of my research skills to learn about these objects. This has been a very educational experience for me because it has combined all aspects of research, collections management, and interpretation into one project. I have worked on exhibits in the past where I was responsible for just the research or just the interpretation but I have never been solely responsible for the entire project. It is intimidating knowing that I have no one to blame but myself if the project does not meet my standards. By having control of all aspects of the exhibit, it has forced me to grow as a public historian and an educator. I am looking forward to the completion of this project and the knowledge that I have what it takes to make it as a professional historian. This entry was posted in HistoryMaking on July 3, 2018 by Sandra Enriquez. 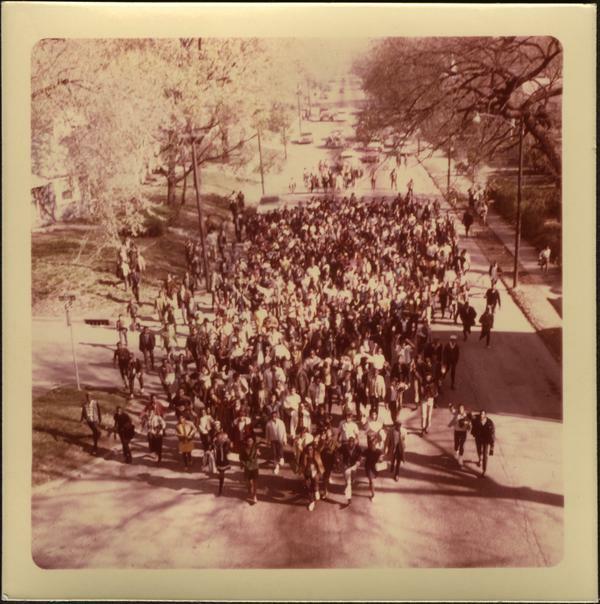 In this photo from the 1968 Riot Collection in UMKC’s LaBudde Special Collections, protestors march down Vine at Flora and Paseo. On April 4, 1968, in the midst of nationwide social and political turmoil, Martin Luther King, Jr., was assassinated. On April 9, the day of his funeral, Kansas City (MO) Public School officials chose not to cancel classes. In protest, students from Lincoln, Manuel, and Central High Schools marched from school to school and finally to City Hall. They were followed by police officers dressed in riot gear. Though it is unclear what prompted police officers to begin firing tear gas on the crowd, the confrontation between police and protestors escalated. By that night, the demonstration had given way to chaotic riots that lasted four days. Many buildings around 31st Street and Prospect burned, protestors and officers were injured, and six African American citizens were killed. The 1968 riots were a painful moment in Kansas City’s history, but they also raised questions and launched conversations about racial tensions and social disparities—conversations that continue today. The 50th anniversary of these events this spring prompted articles and documentaries (like this one by KSHB), panels (like the “’68: The Kansas City Race Riots Then and Now” held at the Kansas City Public Library), and exhibits (like this one at the Central Branch of the Kansas City Public Library). KCUR drew attention to the collection in UMKC’s LaBudde Special Collections, and called for help identifying the subjects of the photographs. The unnamed faces and unclear contents of those photos reflected a crucial problem: we needed to do more to preserve people’s memories and perspectives. Photographs and official reports are important parts of the historical record, but so, too, are the recollections of the people who participated. 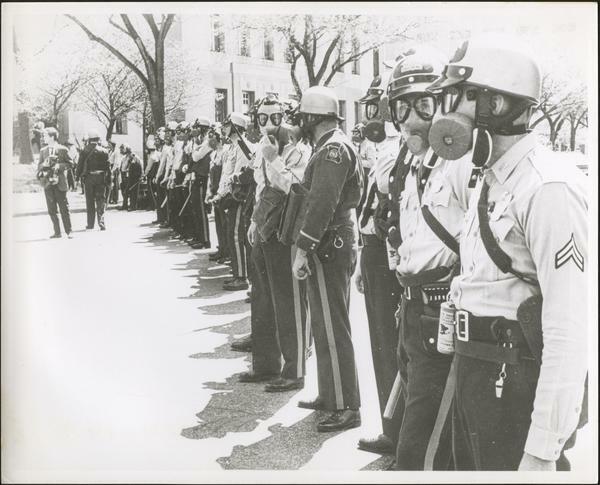 In this photograph from the 1968 Riot Collection in UMKC’s LaBudde Special Collections, police officers line up outside of City Hall wearing gas masks and carrying billy clubs. To correct this problem, KCUR’s Director of Community Engagement Ron Jones, Miller Nichols Library Advancement Director Nicole Leone, and UMKC Assistant History Professor Sandra Enriquez teamed up to launch the 1968 Oral History Project, an effort to interview Kansas Citians who experienced or participated in the 1968 demonstrations. Their goal is not only to gather recollections of the protests, but also to understand the broader context of racial tensions and social problems in Kansas City before and after 1968. I was invited to join the project as a graduate assistant. At our first recording session, held at the Lucile Bluford Branch of the Kansas City Public Library in May, I watched Dr. Enriquez conduct three interviews. Though I am no stranger to interviewing—my background is in newspaper journalism—I was grateful for the opportunity to observe an oral history interview. There are subtle but important differences in the historian’s approach to interviews: Where journalists are focused on the details of a specific event, historians want to pull back and get a bigger picture, understanding the context that motivated the interviewee and influenced their perspective. Reporters are often pressed for time, keeping interviews tightly focused, asking questions that they hope will provoke clear answers and interesting quotes, and focusing on how the interview relates to the story at hand. Oral historians have the luxury of more time to follow the subject down interesting trails of thought. Perhaps even more important, oral historians do not always have a clear goal for the interview, except to preserve the subject’s responses. As a result, historians cover more terrain—I find myself wondering what a future historian will curse me for not asking about during my interviews. I conducted our second round of interviews on Saturday, June 16, at the Southeast Branch of the Kansas City Public Library. My greatest fear was that, despite my backup batteries and backup recorders, I would run into some technological problem. All went smoothly, though, and I was able to settle in to listening and asking questions. In a future post, I’ll talk more about the interview process, some of the things I am wrestling with in my role as an oral historian, and the challenges of conducting oral histories. For now, though, I will say that it is fascinating to sit and really listen to a variety of people share their overlapping but different stories. Some themes emerge, some of the same names and places come up again and again, but each person also brings a unique perspective, shaped by their families, their experiences, and by their lives after these events. This is my first foray into oral history, and I am hooked. Maybe it’s the former journalist in me, but the opportunity to engage in a conversation about people’s memories is a powerful experience. Not only do I believe that oral histories complement existing archival sources like photographs and documents, but studying oral history has prompted me to rethink the historical sources I encounter. We often fall into the trap of taking written sources at face value, as moments somehow frozen in time. As I listen to how seamlessly our interview subjects connect the events of 1968 to the social and political struggles facing our country today, I’m struck with the knowledge that all of our experiences and memories are influenced by what came before, and will continue to impact the events that follow. Examining the complicated interaction of context, continuity, and change is what gives history its thrill. We have conducted six interviews so far. We are hoping to interview far more to gain as much understanding as possible, and one of my jobs is to find additional interview subjects. So please: If you or someone you know would be willing to share your experiences of the 1968 protests and riots in Kansas City, I would be grateful to hear and record your stories. Please reach out to me at kbcm97@mail.umkc.edu. You can also find me on Twitter at @katebcarp. This entry was posted in HistoryMaking and tagged 1968, Internship, Kansas City Public Library, kcur, kshb, LaBudde Special Collections, miller nichols, Oral History, riot on June 21, 2018 by Kathryn Carpenter. The Missouri Historical Society is accepting applications from students who are interested in an unpaid internship within our photographs and prints department at the Library & Research Center. This position will report directly to the photographs and prints archivist. The intern will work on completing an inventory of 1950s-era photographic negatives from the St. Louis Public Schools Photograph Collection. The intern will compare negatives to a listing of images; learn to identify film types, and evaluate and record their conditions; arrange the film in appropriate storage containers; and record their locations. The ideal candidate will have strong attention to detail and an interest in photographic history. The work schedule is flexible, with hours typically between 9am and 5pm, Monday through Friday. A minimum of 15 hours of work per week is required. The final schedule will be determined with the supervisor. The ideal candidate will be an undergraduate majoring in library science, history, American studies, or a similar field of study. Some experience with Adobe Photoshop is preferred. The ideal candidate will also be detail oriented and have strong written communication skills. To apply for this position, please submit a résumé to Vicki Kaffenberger and Tamaki A. Harvey Stratman at vak@mohistory.org and tamaki@mohistory.org. Candidates will then be directed to complete a full application. If selected for an interview, candidates will be asked to supply two references. For questions, please contact: Vicki Kaffenberger at vak@mohistory.org or Tamaki A. Harvey Stratman at tamaki@mohistory.org. The Missouri Historical Society is a nonprofit organization that serves as the confluence of historical perspectives and contemporary issues to inspire and engage audiences. This entry was posted in HistoryMaking on April 5, 2018 by Sandra Enriquez. I’ve finished compiling all the gathered information about the objects in the Alexander Major’s House into an Excel spreadsheet, which I believe will then be imported into PastPerfect (the museum’s collections management software). There are several required fields that must be filled out when adding object records for accession. One is the Collection field. I decided to have each room of the house be its own collection. For example, there’s a painting of Alexander Majors in the house’s entry hall, so it will be part of the Entry Hall Collection. Objects are given both a less descriptive Object Name, as well as a more descriptive Object Title. The Object Title would be “Oil Painting of Alexander Majors,” while the Object Name would simply be “Painting.” The Object Description includes even more details about an object, including information about the object’s specific location in the room, it’s composition, place of origin, etc. For instance, the Object Description for the Major’s painting contains details about the artist and painting, like how it was painted by local artist Mary Campbell and was based on a tintype of Majors at age thirty-six. Other information required in an object record include the date the object was made, the name of the donor, the catalog date, and the name of the staff member who cataloged the object. The most difficult part has been finding out who the donor of an object was, which I am currently working on by looking through old newsletters and organizational papers. This entry was posted in HistoryMaking and tagged Archival Methods, Collections Management, Historic Preservation, Kansas City Local History, Wornall-Majors House on November 19, 2017 by Kevin Ploth. The Congressional Leadership Fund is currently seeking students interested in learning more about campaigning and effective public communications. Student interns will gain invaluable knowledge about the democratic process and work to become adept communicators through hands on experience with elected officials, candidates, and the general public. The internship opportunities for this Fall are open to any student; however, they must apply and be accepted. Hours are flexible, but students must be able to commit to 8-10 hours per week and are responsible for their own transportation. Congressional Leadership Fund will be an important part of this election and you will have a firsthand view of what it takes to win a campaign. Eligible students will be provided with academic credit or service hours. While these positions are unpaid, they will provide political opportunities not available elsewhere and upon completion of the program, a letter of recommendation to a future employer or college will be provided. If you have any questions or would like more information, please email Blake Hale at bhale@theclf.org. This entry was posted in HistoryMaking on October 19, 2017 by Sandra Enriquez. My first several weeks working as a collection intern at the Alexander Majors House Museum have proven to be both challenging and engaging. My past public history experience has been primarily in archives and this is the first internship where I’ve been able to work with museum objects. My initial assignment was to make an inventory of the house’s objects. This has been a bit daunting, given that there are a total of fourteen rooms and hallways, each chock-full of artifacts. The ultimate goal of the internship is to catalog all objects into the museum’s database for accession. The most common obstacle has been my lack of knowledge about Victorian period antiquities. Fortunately, I was provided with a rough list and description of each room’s objects. With the aid of my smartphone and the internet, I researched objects on the list and compared them with objects in the house. For example, after learning about the aesthetic differences between Bristol and Old Paris vases I was able to distinguish them throughout the house. However, there have been instances where I’ve been completely baffled by an object and its purpose. For instance, there are some odd utensils in the kitchen whose functions completely elude me. In these cases, I write the best description possible and make a note to get help identifying it later. I then take pictures of the object for later identification. Once finished, I’ll go through the house with my supervisor and reexamine those particular artifacts. Identifying and learning about Victorian artifacts has been a rewarding experience. This knowledge will become especially useful if I plan to work at a museum dealing with this time period. This entry was posted in HistoryMaking on October 4, 2017 by Kevin Ploth.